In Swaziland, nurses and midwives are at the frontline of caring for their communities, forming a critical cadre in tackling the country’s health challenges, such as the tuberculosis and HIV and AIDS epidemics. As the country’s leading organization for overseeing the country’s nurses, the Swaziland Nursing Council (SNC) has a legal mandate to regulate, direct, and control the education and practice of nurses and midwives, who make up more than 80% of the total health professionals in the country. According to the Council, there are 3,793 nurses in country, of which 1,500 work in the public sector. Cognizant of SNC’s pivotal role in strengthening health care delivery, the President’s Emergency Plan for AIDS Relief (PEPFAR), through the HFG project, has been supporting this important organization. As the SNC has expanded its activities to fulfill its mandate, the Council has required more space to effectively conduct its work. 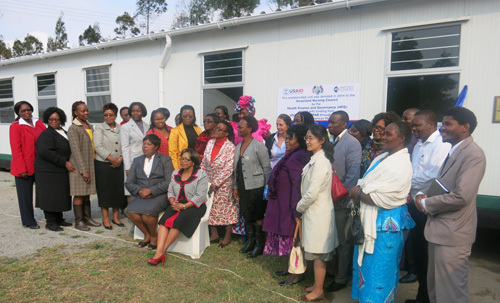 PEPFAR supported the procurement of a pre-fabricated trailer to meet their need for adequate office space and meeting facilities. Recently, the HFG project facilitated the opening of this new space. At the official launch on September 29th, Glory Msibi, Registrar of the SNC, welcomed more than 100 supporters, including the Honorable Senator Sibongile Ndlela Simelane, Minister of Health, Vusi Samuel Magagula, Director Health Services, and Lucille Bonaventure, PEPFAR Coordinator. This new space, coupled with technical assistance from HFG, will help to ensure a more sustainable future for the organization. Dr. Ann Lion, HFG’s Project Director, attended the ceremony as did HFG Swaziland’s Chief of Party, Nonhlanhla Dlamini, Dr Grace Namaganda, Senior Human Resources for Health Technical Advisor, and Zee Masuku, Social Worker Advisor. This year, the HFG project has supported the SNC in developing entry-to-practice nursing competencies. These competencies lay the foundation for the development of the country’s first entry-to-practice licensure examination and the review of pre-service nursing training institutions’ curricula. Ultimately, these activities will contribute to a better trained, better supported nurse workforce as it tackles one of the world’s highest HIV prevalence rates and works towards an AIDS-free generation.